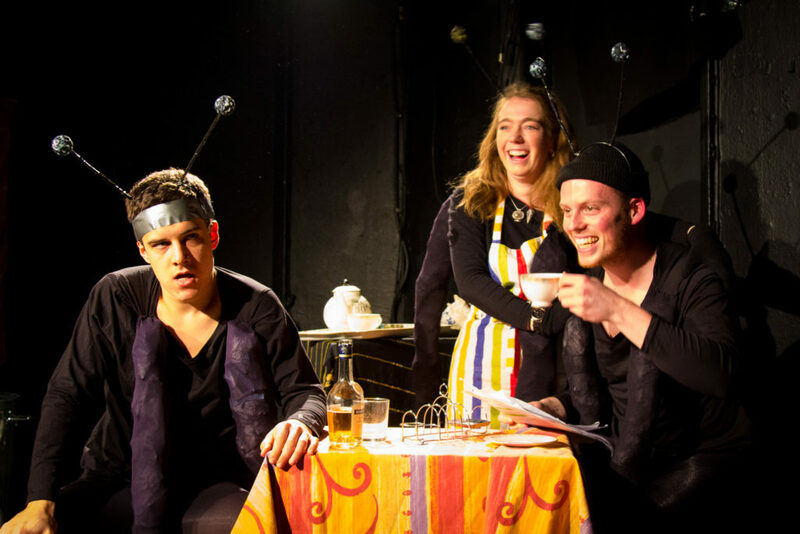 ‘As If’ – a comic theatre company comprising Exeter Uni alumni – present this Mighty Boosh style narrative sketch show and strong contender for strangest show currently on in London. This is essentially a collection of surreal skits loosely marshalled into a shaggy-dog narrative. The plot (if the term applies) concerns a washed-up, Withnail-esque rock musician called ‘Hawk’ who speaks to his alter-ego via a mirror in his Ukelele. After years of apparent failure, Hawk composes ‘the greatest rock song of all time’ but is devastated when the lone copy of its chord sheet is stolen, sending him on a wild goose chase to uncover the culprit. A german electro diva who invites her boyfriend to chew on her strawberry lace hair and a kitchen sink drama about a family of ants give a taste of the wackiness on offer here. Shows in this relentlessly zany style can be trying. However, a good deal of smart, pop-music based humour (one twist on an NWA lyric prompted applause) and several inspired characters called things like ‘Barnaby Carnaby’ and ‘Crystal Beth’ balance out the show’s more self-indulgent impulses. There are also some promising visual ideas: a man fitted out with antennae who picks up radio signals and a creatively staged final revelation scene suggest an imaginative directorial hand. Committed performances sustain the energy even when the writing falls apart. Jake Tacchi, as DCI Sting and Anthony, the furious patriarchal ant, was especially funny. The company has commendable philanthropic objectives: they have worked with Good Chance Theatre and a portion of their ticket sales go the charity, War Child. However, the show perhaps wears its Fielding & Barratt influence a little too far on its sleeve and some riffs run perilously close to direct Boosh rip-offs. It is very baggy, evidently under-rehearsed and the hit/miss ratio tilts towards the latter as the show goes on. A crowded cast (eight actors) results in numerous characters feeling underdeveloped or superfluous. In all, it’s a show with some wittily surreal ideas, but one which requires a good deal of tightening and refining. From their new home in Tottenham Hale, Theatre N16’s collaboration with Styx art space provides a challenging yet creative location for its programmes. Behind a trendy outside bar area, the shows are staged in the bleak warehouse of an old brewery, allowing plenty of scope for invention. 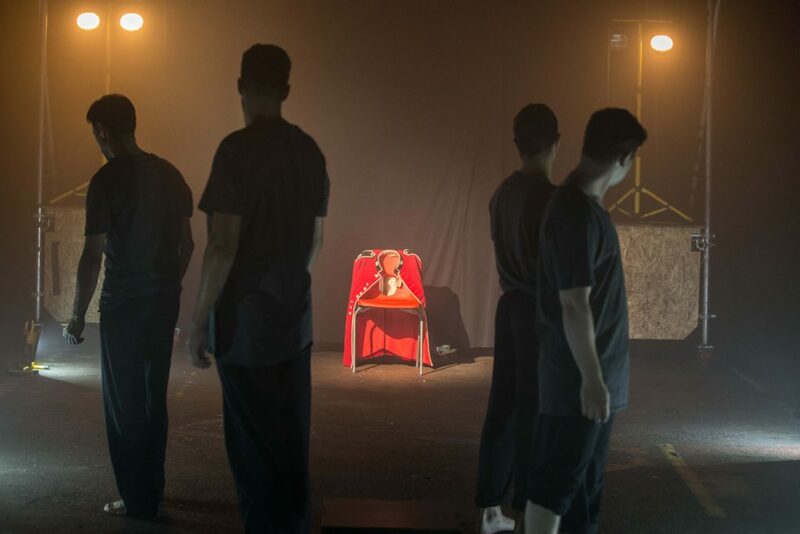 Proforca’s director, David Brady, cleverly uses this stark setting to bring out the darkness and pathos in Oscar Wilde’s ballad, ‘Reading Gaol’, written in reaction to his time in prison. Free but disgraced, his last work is not only in protest at the Victorian penal system but also an exploration of the paradoxes of morality as he describes the execution of one and the collective feelings of the other inmates. In this production, an updated version, new writing has been incorporated to expand on the ideas of freedom, oppression and conflict. Beams of light, smoke and sounds effects combine to create an atmosphere of desolation. A scarlet jacket on a red chair is the only focus of colour. Five actors recite the ballad, pacing like prisoners to its plodding meter. At intervals, each in turn offers a character to illustrate the vulnerability of human nature and its consequences. Breaking up the poem with fresh material is effective considering that the rich, detailed language is hard to assimilate in one sitting, some lines being thrown away due to a lack of clarity and expression. However, at almost two hours running time the work could do with more contrast and development to illustrate the various parts of the original text and to expound the ideas it inspires. The three central stories make the most impact. ‘Human’ uses imaginative, dramatic lighting effects with handheld lamps and a strong performance by Nic James to take us to the jungles of Africa. Interestingly offbeat in its rhythm, ‘Guardian’ sees Malcolm Jeffries anxiously fighting his isolation and in a soulful tale, ‘Innocent’ tells of a country lad, touchingly played by Miles Parker, in prison for his naivety. But it is the first and last parts which require stronger personality to give the play its overall shape. James Vincent underplays the disturbing quality of the cold-blooded ‘Monster’ and the writing of ‘Hero’ (Nick Cope) fails to convincingly finalise the play with its meandering thoughts. Even though it could do with a spot of further remodelling, it has the novelty of mixing classical and contemporary narrative and a great sense of live performance from the moment we enter the building. The technical aspects are innovative and slick and the actors work well together and individually, and all in a venue which will be a discovery for most.